Mine is a little bit busy with all the parent teacher meetings for the end of the first period, but I took a little time today to share with you this delicious recipe we have for our dinner tonight : leek and goat’ s cheese quiche, a shortcrust pastry also known in French as pâte brisée, some leeks, some goat’s cheese with garlic and chives. 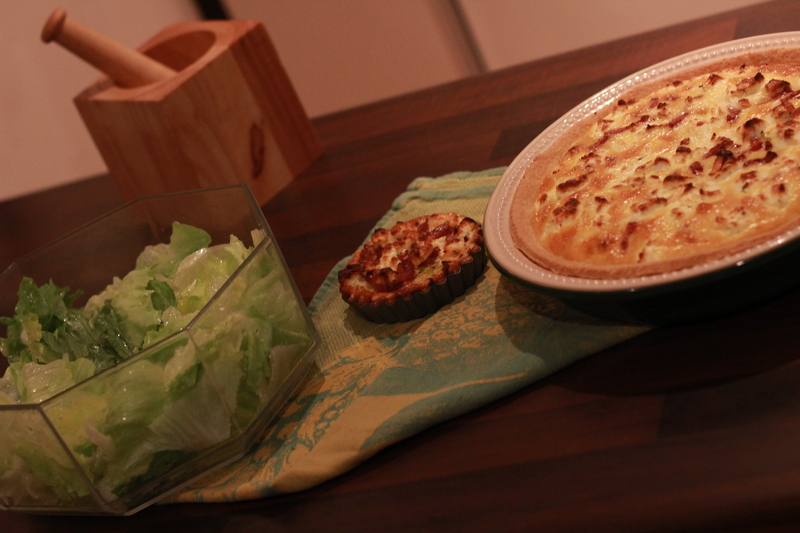 Actually leeks are at their best, so be sure to try this lovely quiche before the end of the season. Yes, I try every time possible to eat fruits and vegetables when they are in season, first they are cheaper, and most important they taste much better. 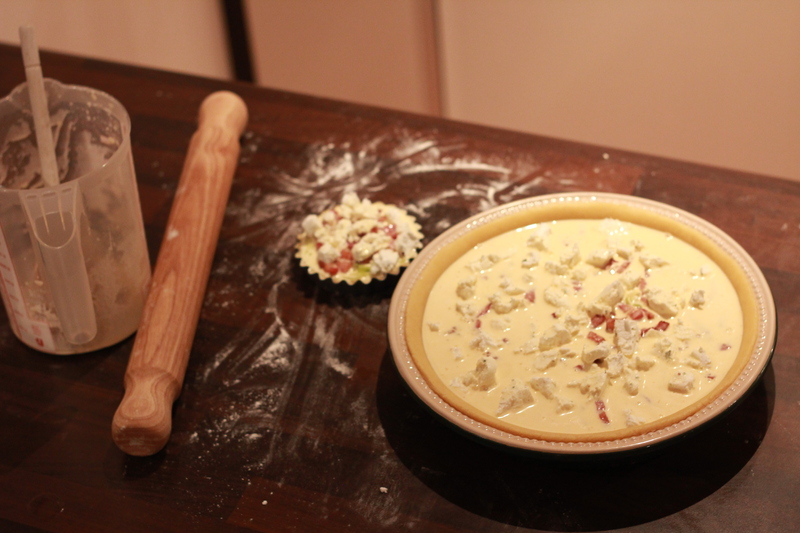 To make the pastry, put the flour and salt in a large bowl, and mix together. Add the butter and rub with your fingertips, until the mixture resembles fine crumbs. Then add the egg yolk and water(start by 4 tablespoons, and if you need more, pour little by little), and mix to make a smooth dough. Turn the dough out on a floured surface and knead briefly. Wrap in a piece of cling film and chill for 30mn. 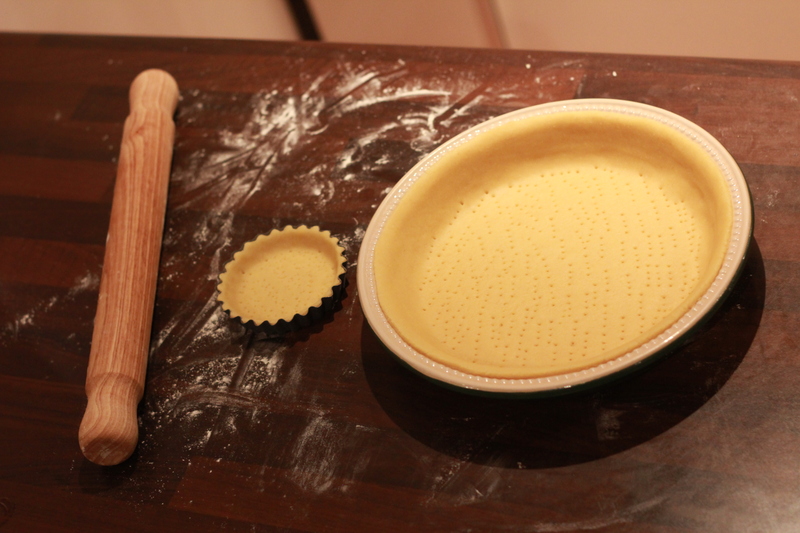 On a lightly floured surface, roll out the pastry and line your tin. Prick the base of the pastry with a fork, and chill. 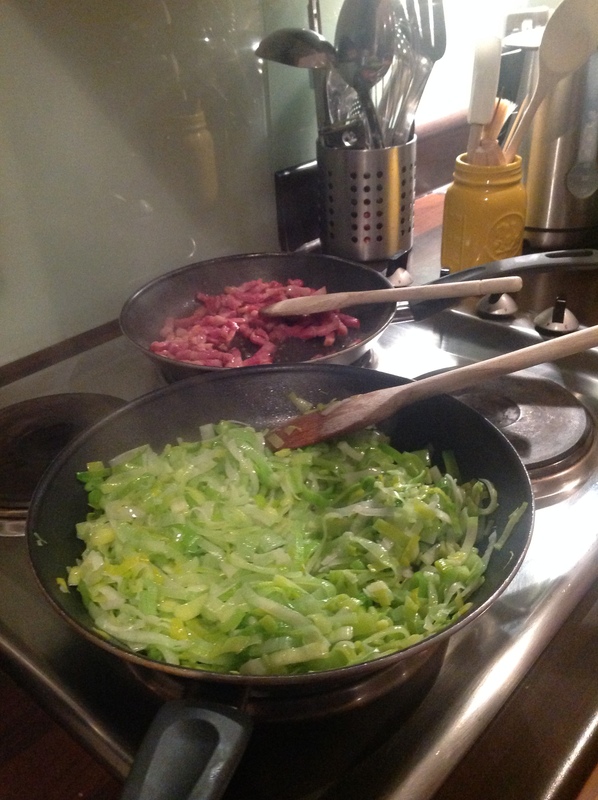 Heat a large frying pan with olive oil and cook the leeks for 10mn, set aside to cool slightly. In another frying pan, dry-fry the pancetta, set aside. Whisk together the cream, eggs and season to your taste. Spread the leeks over the pastry case, add the pancetta, then the goat’s cheese, pour the mixture cream/eggs and bake for 30 mn or until golden and just set. Et voilà, a good mid-week dinner. I serve mine with a nice crispy iceberg lettuce with a home-made vinaigrette. With the festive season around the corner, why not try to serve this as a starter in individual portions like I did for hubby lunch for tomorrow ? I guarantee you, it’s going to be a success. OK that set for today, but one more word, even if we don’t celebrate thanksgiving in Ireland, I would like to take this opportunity to wish a happy thanksgiving to my family in America, and my American followers, and for all of you make sure to be grateful everyday for what you already have. See you very soon for the beginning of the Christmas preparations. Oh wow it looks so good!! Thank you, it tastes delicious too.